1. Whisk together all ingredients for the dressing (or put everything in a small blender and blend) and set aside until ready to use. 2. 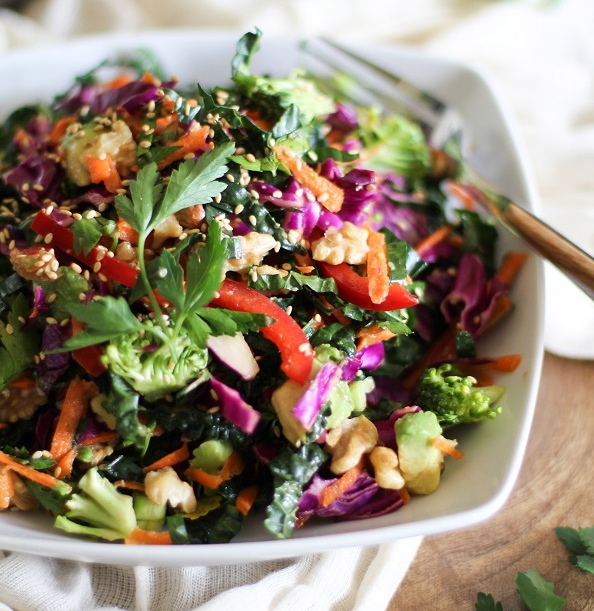 Add the kale, cabbage, broccoli, bell pepper, and carrots to a large serving bowl. 3. Pour desired amount of dressing over the salad and toss until everything is coated. 4. Add the parsley, diced avocado, sesame seeds and walnuts and toss again. 5. Serve as an entrée salad or as a side salad to your favorite meal. • I used dinosaur kale, but you can use any type of kale you like. • You can also use avocado oil or olive oil in place of grapeseed oil in the dressing. For additional recipe details, please visit the site of our generous contributor: The Roasted Root.